Can Classical philosophers like Epictetus and Aristotle shed light on some of the most pernicious elements in online culture today? 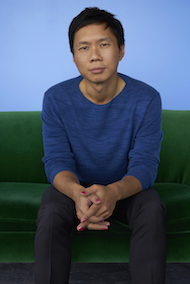 Artist and writer Paul Chan leads us on an idiosyncratic tour of Greek writers and thinkers who grappled with something similar to what we would call "our data" today. Homer and Plato, as well as later thinkers like Pliny and Thomas Aquinas, make appearances. Along the way, Chan reveals how art offers us a unique way of becoming more vigilant against data thieves and fake news makers, then and now. How did ancient objects make their way from discovery to display in early modern Rome? Art historian Barbara Furlotti reconstructs the long and often complicated journey of artworks from excavation sites to elite Renaissance collections. She examines the cast of characters responsible for bringing antiquities to market, from laborers at dig sites and cunning dealers at marketplaces, to skilled restorers who cleaned and repaired the pieces to the well-read antiquarians who gave them new layers of meaning. From the Buddhas of Bamiyan to the Temples of Palmyra: Why is the World's Cultural Heritage Being Erased? The destruction of cultural heritage fits a pattern from Mecca to Timbuktu, and from Palmyra to Nineveh, today's Mosul. James Cuno, president and CEO of the J. Paul Getty Trust, joins Terence Ward, author of The Wahhabi Code: How the Saudis Spread Extremism Globally, to explore what lies at the root of these crimes against cultural heritage and what the world can do about it. If you've been thinking about donating your time to an arts institution, consider joining the Getty's Docent Program. We believe in welcoming visitors with open arms, embracing diversity, and creating magic in the galleries and gardens. 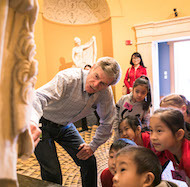 You'll learn how to use enthusiasm, close looking, and dialogue to bring greater meaning to the Museum's art. Recruitment for new docents at the Getty Center and Getty Villa begins in May. Come join our team! HOURS: Weds–Mon: 10 am–5 pm. Closed Tuesdays and on January 1, July 4, Thanksgiving, and December 25. The Getty Villa is an educational center and museum dedicated to the study of the arts and cultures of ancient Greece, Rome, and Etruria. Public and scholarly programs at the Villa include lectures, seminars, workshops, and symposia, and complement the interdisciplinary activities of the J. Paul Getty Museum, the Getty Research Institute, the Getty Conservation Institute, and the Getty Foundation. The permanent collections of the Museum and the Research Institute, changing exhibitions, the annual scholar research theme, conservation issues, theater productions, and research projects inspire programs for scholars, students, specialized professionals, and general audiences. Admission to the Getty Villa is always free. An advance, timed ticket is required. Each Villa ticket allows you to bring up to three children ages 15 and under with you in one car. This does not apply to tickets for events, such as lectures and performances. Tickets are available online or by calling (310) 440-7300. Ticket availability is updated weekly for a two-month period. Same-day tickets may also become available online without advance notice. Parking is $15, but $10 for evening events after 5:00 p.m.